Screens. A major part of achieving the Moroccan style the homeowners love was adding these intricate, laser-cut, powder-coated bronze screens. “They bring another visual and functional layer to the design,” Duffin says. They also help delineate the space between the bedroom and bathroom within the open plan. 4. Design as an experience. I often think about how Frank Lloyd Wright was fascinated with how someone approaches a home and reaches its front door. You never just walk right up to the door; you wind and turn and experience various structures, views, materials and more as the home unfolds and reveals itself. It’s something worth considering and applying to any room in your home, if you have the space for it. 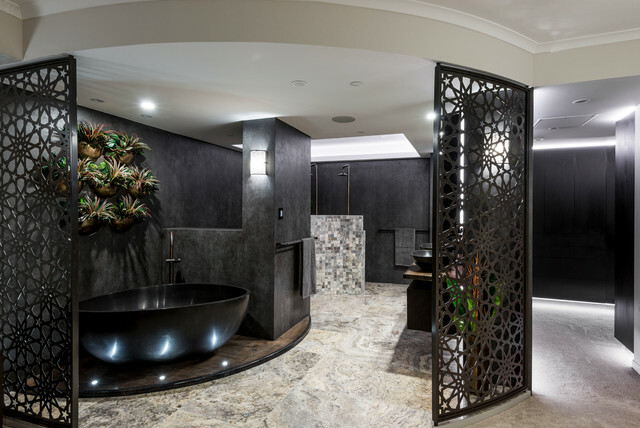 Looking at this elegant black bathroom that Becky Harris has profiled this week, I can’t help but imagine how fascinating the experience must be to meander through the layout and arrive at the various zones, each with a different feel and ambiance. Ove crne plocice sa zida volela bih da smestim na pod nase kuhinje, sa tamnim fugama, naravno. Screens. A major part of achieving the Moroccan style the homeowners love was adding these intricate, laser-cut, powder-coated bronze screens. “They bring another visual and functional layer to the design,” says Duffin. They also help delineate the space between the bedroom and bathroom within the open plan.